Mike Lewis has earned the professional designations of Chartered Life Underwriter (CLU®) and Chartered Financial Consultant (ChFC®) from the American College. The Chartered Life Underwriter (CLU®) designation has long been recognized as the fundamental and foremost educational credential for life insurance professionals. To obtain the CLU® designation, a candidate must complete required coursework, meet experience requirements, maintain ethical standards, and comply with The American College's Code of Ethics and Procedures along with periodic recertification / continuing education requirements. 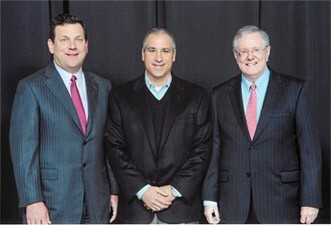 Pictured (left to right): John Schlifske Northwestern Mutual Chairman and CEO, Mike Lewis, and Steve Forbes at Northwestern Mutual's 2011 event in Kansas City.